The Vulcan is present at the Farnborough Airshow. One visitor found a good place to go without having to pay and shot a video clip of his Vulcan experience. The last Vulcan in an airworty condition has returned to the British airshow circuit by displaying at RAF Waddington at the weekend (5th – 6th July). Not only did the crowd see the Vulcan displaying in a wonderful return solo flight, but it also took to the skies with the only airworthy Lancaster World War II bomber, as a tribute to Avro aircraft and a feast for the eyes for all who attended the event. Following the problems on Sunday, where the Vulcan could not fly, the guys have confirmed the problem, and sorted it. In operational mode, the Vulcan could have flown, but after all this time, you cannot blame them for not flying. Mind you, I would have been tempted to send someone back to Bruntingthorpe to grab the spare part that was needed. Still the crowds were treated to a fast taxi and aborted take off on the Sunday which would have made some amends. Now the Delta lady will enjoy a few days at Waddington before she heads off to her next display, probably with a bag of spare parts. In my mind I will now always be able to remember the flight of the Vulcan and the Lancaster, together for the first time. Who says things cannot get better. Well, it could be even better if they paid for the Southend and Wellesbourne Vulcan’s to return to flight too. Cor, imagine three Vulcan’s taking off. Wow, oh well back to my dreams. We look forward to the next display. Take a look at the website. It finally happened, when I last posted on Friday night, I mentioned the CAA permit to fly, but no DA, permission to display. What happens, they grant it. So Saturday finally saw the Vulcan fly in a display after all these years. Congratulations to all those who helped along the way. 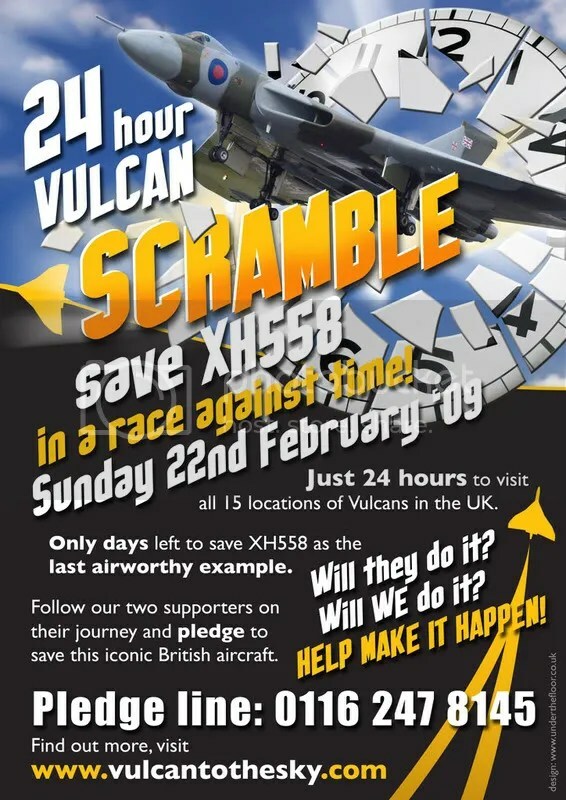 You can still help by visiting the Vulcan website. I’ve added a couple of video’s from Youtube which I feel sum up the performance on Saturday, listen to the announcer on the second one, that’s real emotion. The only upset was the old girl could not fly on the Sunday but then, as we saw before, she does not like being left outside, whereas at Bruntingthorpe, she has her own hanger for warmth. One more old lady in the sky, next target is Concorde, eh! !